Deepwater Horizon 13x20 inch mini movie poster autographed in blue Sharpie by star Gina Rodriguez, who played Andrea. 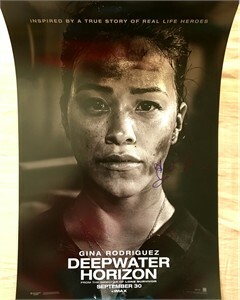 Obtained in person at Annihilation 2018 Hollywood premiere, with certificate of authenticity from AutographsForSale.com. Signing photo is courtesy of Getty Images and is NOT included. Has minor handling flaws and wear. ONLY 2 AVAILABLE FOR SALE.